NOT 1, BUT 2 HUGE MOVING SALES!! Items moved that just no room for, Plus many more. 2 Immaculate Twin bed sets, Bedding, Loads of glassware items, Kitchen/Household items, Clothing - Men, Womens, Hunting, Movies, Books Lots of stuff!! To check your local area for Garage Sales, check this out!! They would work to send small snack bags in school lunches. Great for snacking in the car because they are not sticky or messy at all. I had a hard time finding them at first, so I just bought them from Amazon. Funny story with that. I purchased a case of these, took some out and put away the others. Well my on target MS Brain did not let me remember where I put it at....4 years later, I accidentally found it.. Some of these, the banana ones had gotten soft. But the pineapple ones were still crisp and edible.. They weren't the best in the world, but they still were good. Hey what do you expect? Now, I have seen them in lots of grocery stores. Winn Dixie was the last place I found them at. But they were in the Produce section. 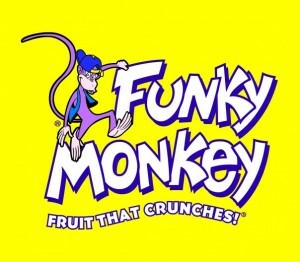 Im not sure that is a good place to put them, but hey I found them..
Every ounce of Funky Monkey Snacks, is packed with 3 full servings of real fruit healthy goodness. No added sugar, no sweeteners, no artificial colors and no preservatives but simply great fruity taste. During the freeze drying process, the nutrients of the organic fruit is retained. Shop @ Shopko.com & save on Hundreds of Deals!!! AND check out the12 DEALS of Christmas Today!!!! This site has some AMAZING sales going on!!! More to be coming soon!! Amazon had some awesome Black friday Sales, then it went to Cyber Monday- week, Now It is Holiday Flurry Week. Holiday Flurry Deals Week New deals changing daily, They even have more planned for next week also. Check out the deals! 80% Off Fragrences at Amazon If you sort these by price, you will find some that you only need to pay for shipping @ $4.99! !